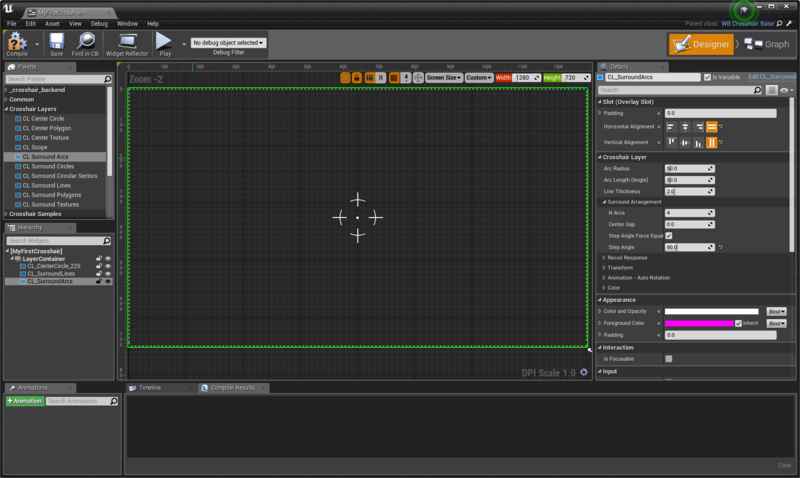 In step 2, we will add layers to define a crosshair. For this crosshair, we will use three layers: CL Center Circle for the center dot, CL Surround Lines for the four surround lines, and CL Surround Arcs for the Four surround arcs. 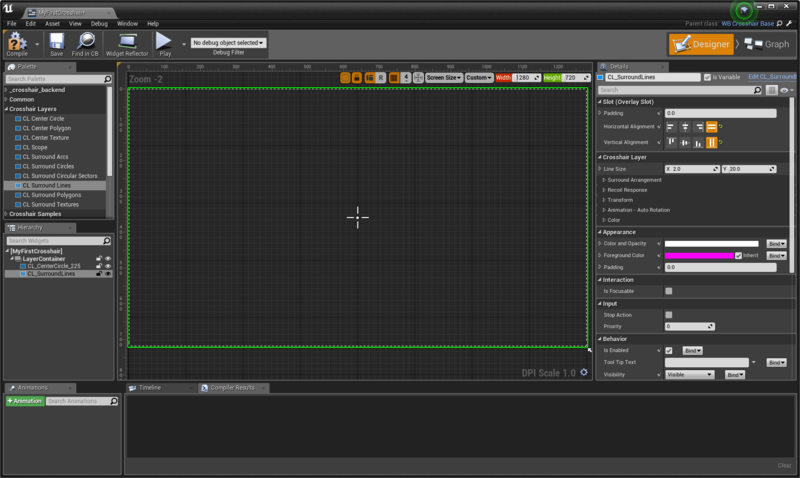 First, open the empty crosshair widget MyFirstCrosshair at MyCrosshairs/MyFirstCrosshair. The crosshair layers to be used are in the Palette’s Crosshair Layers category. Click the category and find the CL Center Circle layer. Then drag it to the designer center viewport. 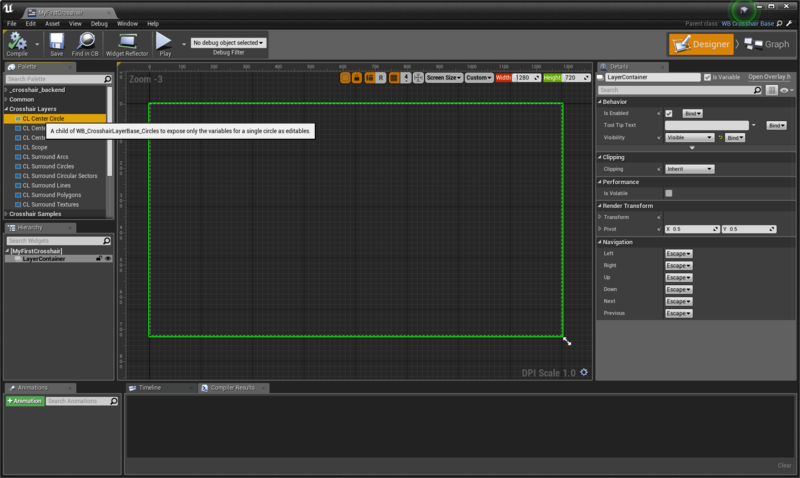 By doing so, a circle is shown in the viewport. Also, a layer named “CL_CenterCircle” is added to the Layer container in the hierarchy. 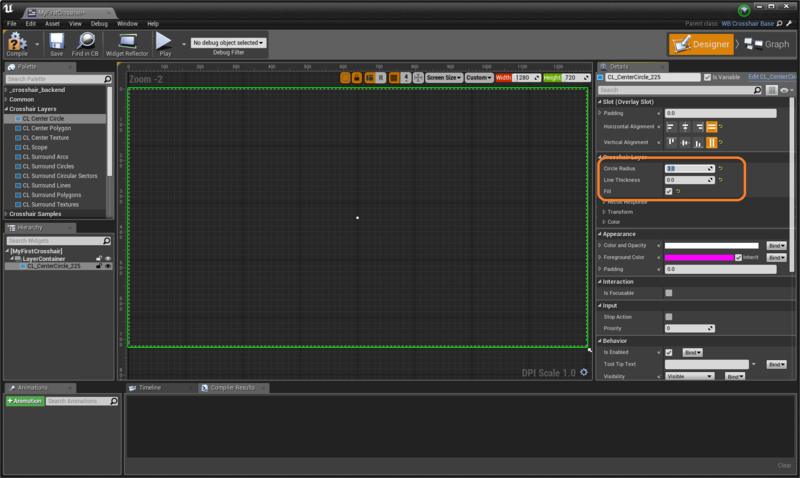 To make it like a dot, adjust some parameters of the layer. In the details panel – Crosshair Layer category, check Fill, change Line thickness to 0, and change Radius to 3.0. Drag the CL Surround Lines layer to the viewport. 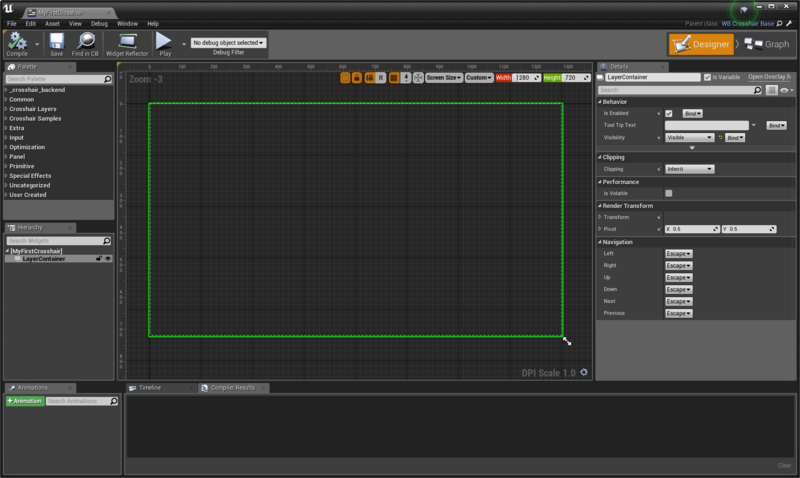 Then in Details panel – Crosshair Layer, change Line Size to 2, 40 to make it longer (2 pixel wide and 40 pixel long). Go to Details panel – Crosshair Layer – Surround Arrangement and change Center Gap to 30 to make the surround lines farther from the center. 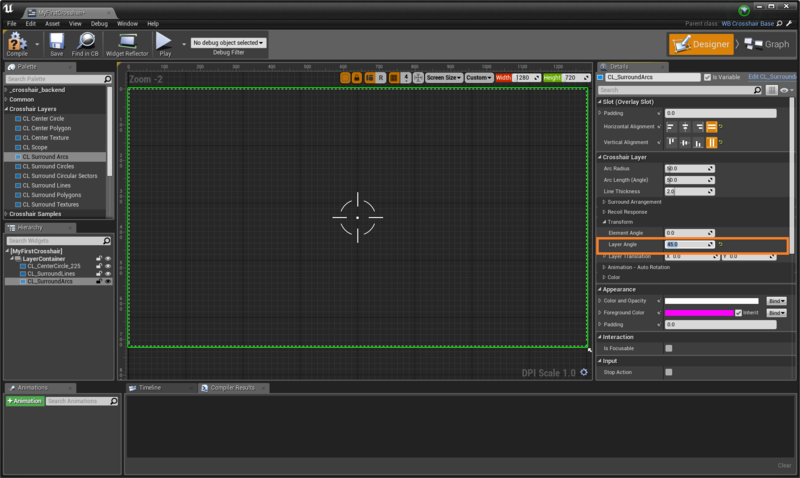 Drag CL Surround Arcs layer to the viewport. Go to Details panel – Crosshair Layer – Transform, and change Layer Angle to 45 to arrange the arcs on the diagonals. You finished making the first crosshair widget blueprint. 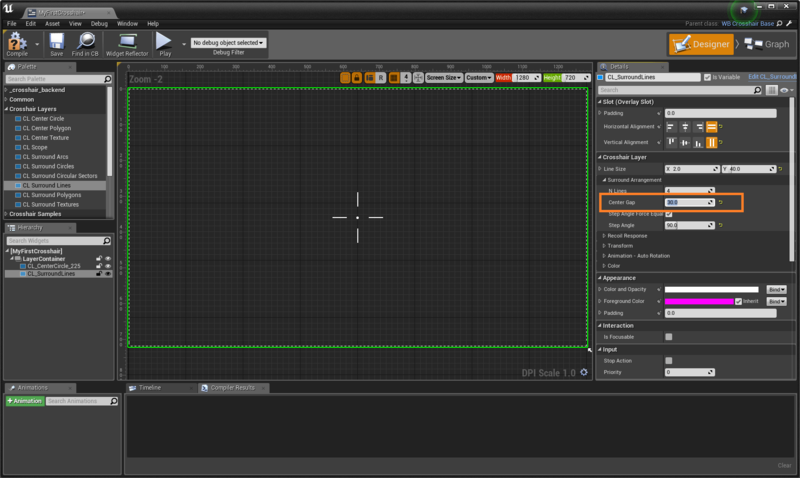 Try changing other parameters in the Crosshair Layer category of Details panel of each layer and see the result. To apply the crosshair to game, see Getting Started: Project Migration (Applying Crosshairs to your game).